In a country where urban plots are in relatively short supply, brownfield sites and garden plots are among the only options available for self builders hoping to create new homes in towns and cities. This inevitably means many projects are built on tight, restricted sites — which can not only throw up design challenges, but create some head-scratching before the build goes on (restricted access and limited space for storage of materials may be issues). For existing homes, particularly those in the capital, limited outdoor space can also mean that extending a property is just not viable. If you want additional space for a growing family, for instance, then you may just have to get creative with your approach. Sites where space is at a premium need not, however, mean that homeowners have to succumb to simple designs. Architects are rising to the challenge, creating exciting homes which successfully tackle the issues posed (as the houses below go to show). 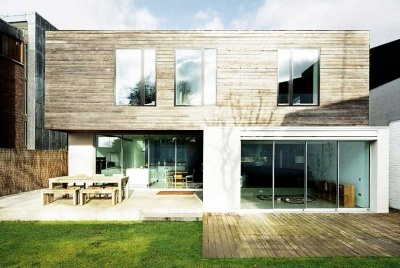 Here we offer some design solutions for building a new home or improving an existing house on a small plot. “The first thing to remember with small plots is that chances are it’s not as small as you think it is,” explains Meredith Bowles, director of Mole Architects. “Consider that a typical Victorian terraced house is only 4m wide — if your plot is 4m wide then you can in theory build a house on it, even if from the outset it looks too small. It’s not until the spaces are there that you appreciate how much room you’ve actually got. Small plots do not necessarily mean you can’t have that large open plan kitchen diner you’ve always dreamt about. By focusing attention to the floorplan, and through careful planning, there are numerous ways of increasing the feeling of space in your home, even if the space you’re working with is modest. Be careful to balance the accommodation you’re creating too. “You don’t want to make the property too ‘top heavy’ by cramming in more bedrooms than you have space for, or equally too many rooms on the ground floor and for the upper floors to be out of sync,” says Brendan Tracey of Phillips Tracey Architects. 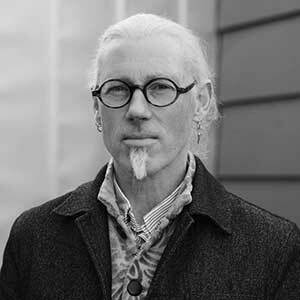 “Make sure too that the spaces you create are flexible enough to meet multiple needs, for instance a study could also be a music room, a guest bedroom or a utility/store,” says Darren Bray. Carefully placed glazing can work hard to brighten the interiors too, says Brendan: “With our Lansdowne Gardens project, from the street the property appears single storey but upon entry you walk into a double-height hallway with full-height glazed wall in the stairwell with a rooflight above. Immediately you feel like you’re somewhere very bright and spacious, even though it’s not a big space at all. On tight sites in urban areas where extending to the side, front or rear isn’t an option, or for self builds where the height of the new building is restricted, digging down is often one of the best solutions. When planning for a basement, it’s important to consider whether the new space will serve as primary or secondary accommodation. While a basement might be perfect for cinema rooms, utility/plant/storage areas or indeed bedrooms (rooms which do not typically require as much daylight as your primary living spaces), unless you are planning to introduce a device such as a sunken courtyard or lightwell, then basements are not well suited for use as a kitchen diner or living area. In this case, it may be best to work with your architect on creating an ‘upside-down’ living arrangement — prioritising the rooms which need most natural light on the floor(s) above. Although basements are often a good solution for increasing the footprint of an existing home, the luxury of added space comes at an expense, with digging a new basement and underpinning costing around £2,000-£3,000/m2. If you choose to introduce lightwells or external access points this will increase the costs further, but it is best to consult with your architect, quantity surveyor and/or contractor in order to gauge a more accurate idea of what the likely costs are, based on your chosen design, location and access. Be aware, too, that factors such as a high water table, the need to divert drains and difficult ground conditions – clay, sand, marsh, etc – will also impact on costs. Much like digging down, creating space in the roof is another solution for increasing accommodation in your existing home. 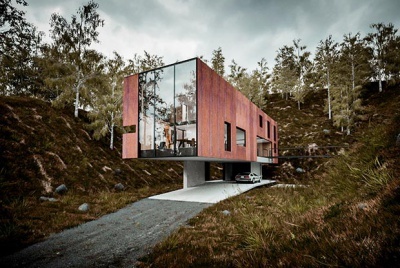 In some instances, you can carry out the conversion under Permitted Development (without the need for planning permission). If your existing loft provides sufficient head height, and is constructed using attic roof trusses rather than web-shaped fink roof trusses (although there are solutions such as Telebeam to aid in the latter instance) then a conversion might be possible on a relatively modest budget. 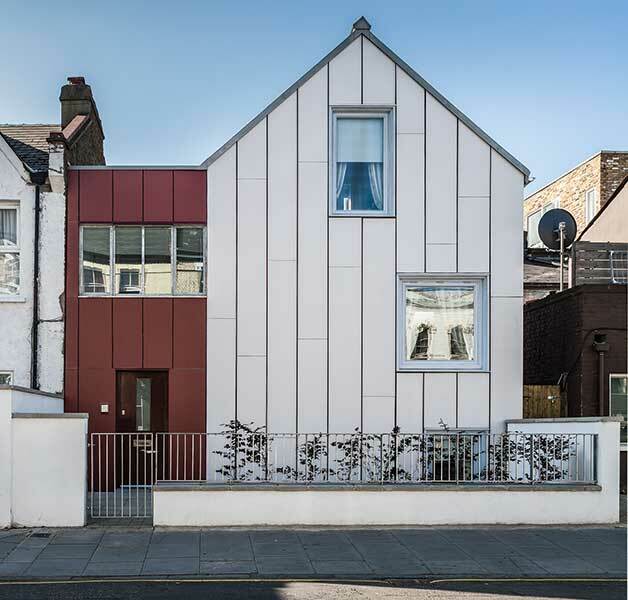 “As a guide, for a loft conversion, expect to pay £1,150 to £1,450/m2, plus VAT, for the finished project,” says Homebuilding’s Michael Holmes. Things start to get a little more expensive if you need to replace hipped roofs with gables, or increase the ridge height of the property and raise the roof. If you are building a new home, designing in rooms in the roof might just provide the space you require when planning puts restrictions on the ridge height. 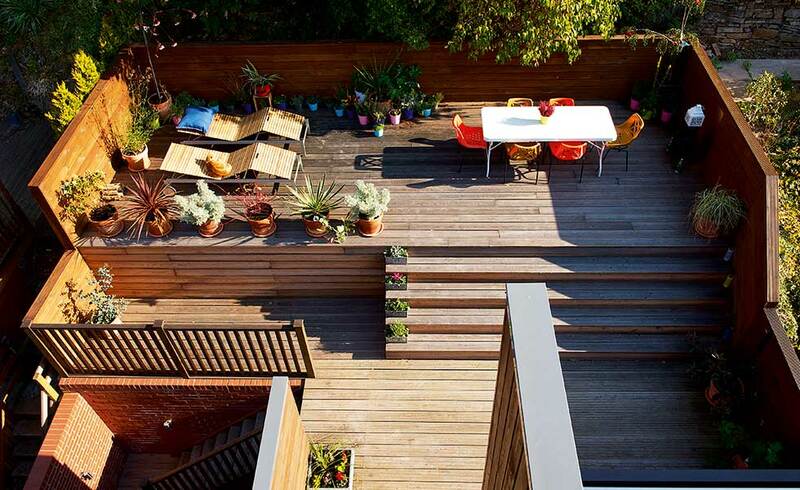 Alternatively, a flat roof may provide valuable space without impacting on neighbouring homes. Boundary issues and Party Wall agreements are the most common problems with small plots. My advice is that if you’re building on a tight site, allow enough room forscaffolding in order to complete the extrnal finishes on the building. Another point to make is ensuring you have access for materials and contractors. I’d recommend taking a contractor out to visit the site at the outset before any work starts, as they will be able to let you know if you can build on it or not. If you’re intending to carry out an extension on a tight site, it’s worth doing a background check to see what the neighbouring properties have done. Not only will you get a sense of what is favoured by the planners but you’ll get an idea of what you do and don’t like, and what can be achieved with the space available. Cost is a key factor to consider. Small complicated buildings are generally going to be more expensive than larger buildings. Corners and junctions of buildings work out more expensive when you don’t have as much wall and roof space in between them, and so on a cost per m2 basis smaller homes are likely to cost more. The chances are if you’re battling with a tight site then you’re dealing with a complicated building, and these are always going to be more expensive than a simplehouse on a simple site. Urban areas, where tight sites are most common, are also harder from a planning perspective, with Party Wall Awards, and two sets of foundations (yours and those of your neighbour) to deal with. 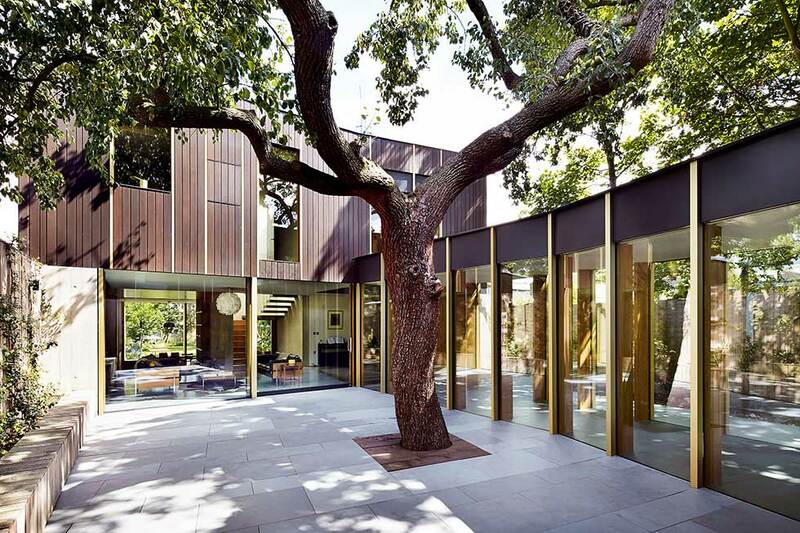 “One trick for creating amenity space with tight sites is to build below ground and then add a courtyard or garden above, which is what we did with our Lansdowne Gardens project in London,” says Brendan Tracey of Phillips Tracey Architects. 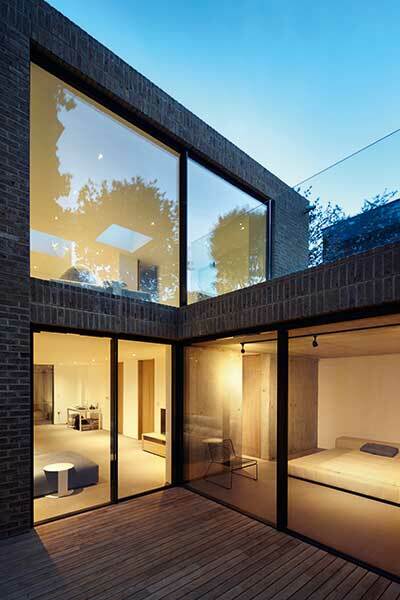 This new home was built on a tight urban plot in central London, utilising a single-storey design to the street, with a basement underneath to maximise on available space. “We built on every inch of the site and put the garden on top of the master bedroom situated at basement level. When you go underground you get that amenity space back, which helps a lot for family homes,” he continues. The low-profile design was very much created with the sensitive site in mind — being in a Conservation Area, surrounded by listed buildings. Sitting behind brick boundary walls, the house appears single storey from the street, with the basement housing a master suite, plant/utility, and guest accommodation/study, and the lower ground courtyard. Carefully orientated glazing which avoids overlooking has then been positioned in the principal rooms in order to increase the amount of natural daylight in the house and create the feeling of open space. “To achieve the space the client needed, we pushed right out to the boundaries to the retaining walls. 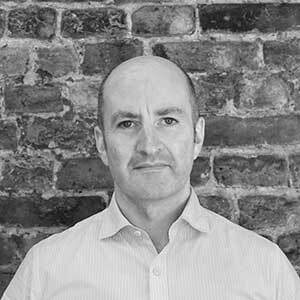 This resulted in a complex (and expensive) battle over Party Wall agreements, but it was necessary in order to maximise on the accommodation space, given the size of the plot,” says Brendan. “We pushed to put the piled foundations on the boundary to gain an extra 10m2 of accommodation, but when you multiply that by the value of space in London it’s well worth it — every m2 is money so it was a no brainer. “When dealing with constrained sites the most important thing you can do is speak with your neighbours. If you know very well that what you’re planning to create could be contentious and people don’t know what you’re doing then they will immediately think the worst. Neighbours are so important as they can make things difficult when it comes to obtaining planning permission, so get them on side early on. If you’re fortunate enough to get planning then you still need to deal with them regarding other elements such as right to light, party walls, etc, so it pays to be on good terms with them. 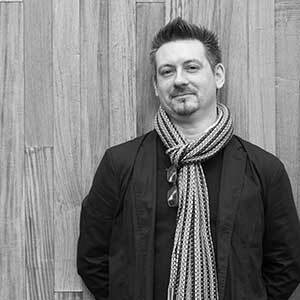 “Services are another thing to think about,” continues Brendan. “If you’re building a basement and the basement sits lower than the main sewage then you have to force things up using a pump. Here, we dug a pit for the big vessel with a pump inside and ran this in the smaller lightwell of the property. 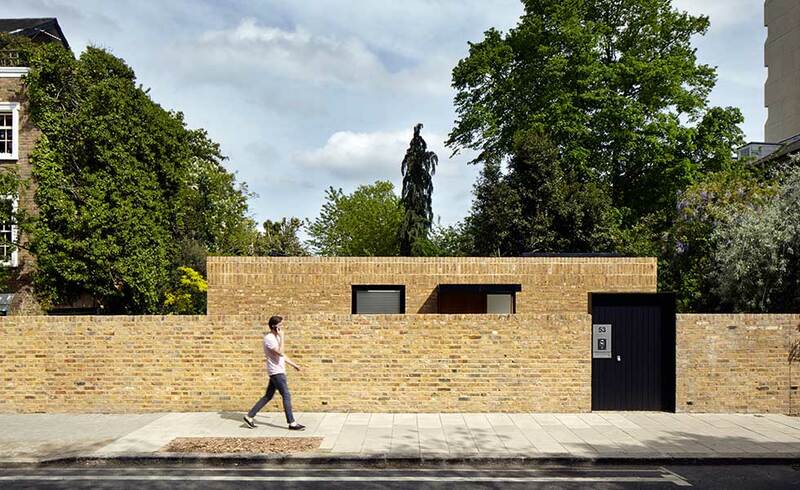 “The clients had owned two of the three garages that sat on the site in Arsenal, London, and toyed with the possibility of building a house here,” says Meredith Bowles of Mole Architects. “They bought out the third garage and came to us with a view to building something to a tight budget which made a design statement. 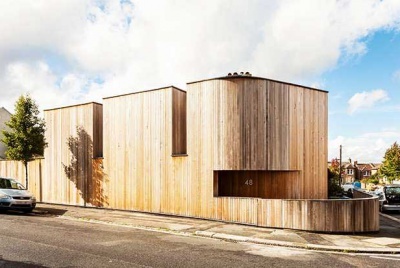 “Gaining planning on a tight urban site is one of the many constraints facing this sort of project, and this site was in a Conservation Area too — it sat on a corner plot at the end of a Victorian terrace to one side and the back of another Victorian terrace to the other. There was an opportunity here to do something more interesting. 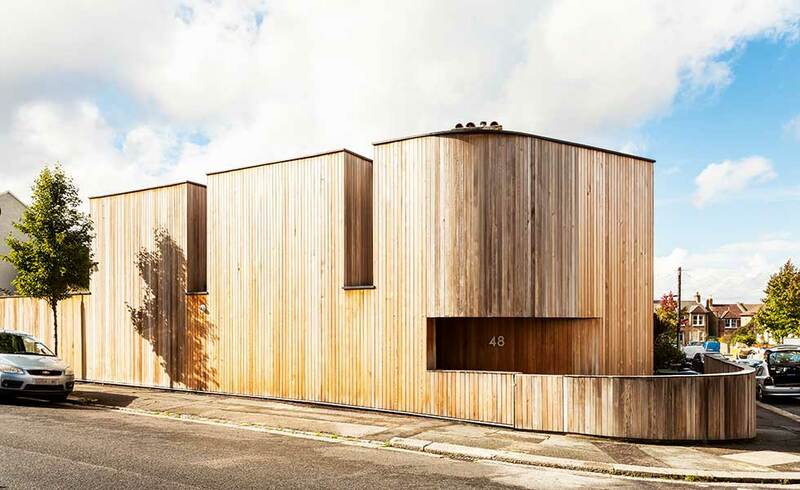 With the site so close to the neighbouring houses, overlooking on the rear south-facing elevation was an issue, so Mole Architects had to devise a way of pulling in natural light. This was achieved with a recess at the rear, which was a real driver for the rest of the house. “To get the amount of accommodation for a decent size dwelling, we had to dig down half a level,” says Meredith. “As a rule, if the floor is more than 4.5m above the ground then you can’t have an open staircase, and instead have to settle for a closed cubicle-like stair, which can take up precious floor space. So, if you can get away from having that and have the stairs open to the rooms, you can in fact not only gain a lot of space but also create the illusion of a more open space. 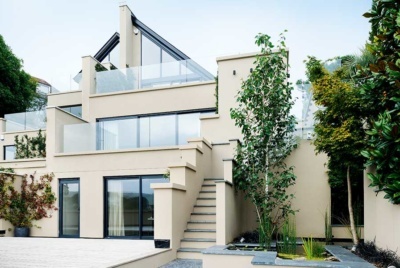 “On this project, being such a small site we could only go up and down, as we couldn’t extend out, so everything is now on a half level, with scissor-style stairs taking you from room to room through the house — maximising the sense of space as well as actual space. 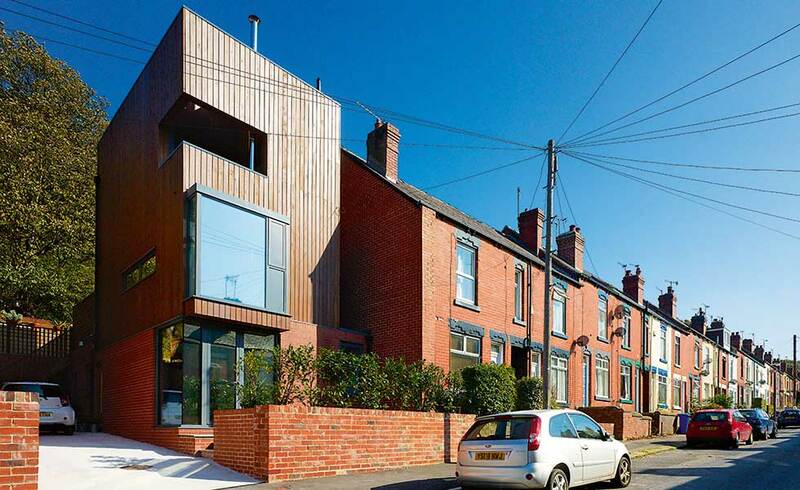 “We wanted to buy a house in Sheffield and the end-terrace property we chose had a large driveway to one side, which had once contained two other terraced houses. These were condemned and demolished in the 1970s, but we hoped to get planning consent to build something else on the land,” says Tom Hunt, who with wife Emily commissioned Halliday Clarke Architects to help them build a new three-storey home (the ground floor of which includes an office space for Tom’s media products business) on a tight 140m2 corner plot of land next door to their previous home in the city centre. They made clever use of the tight footprint by excavating back into the hillside to form an external yard/bike store, with an upper terrace at first floor level, as well as a further staircase leading up to a roof terrace. The project goes to prove that you don’t have to sacrifice external amenity space when building on a tight, urban plot. Built-in balconies to the master bedroom, for instance, also allow for additional break-out spaces from the internal areas. “The plot is exactly the same size as our previous house but by building upwards and backwards the new property is almost twice the size,” says Emily. 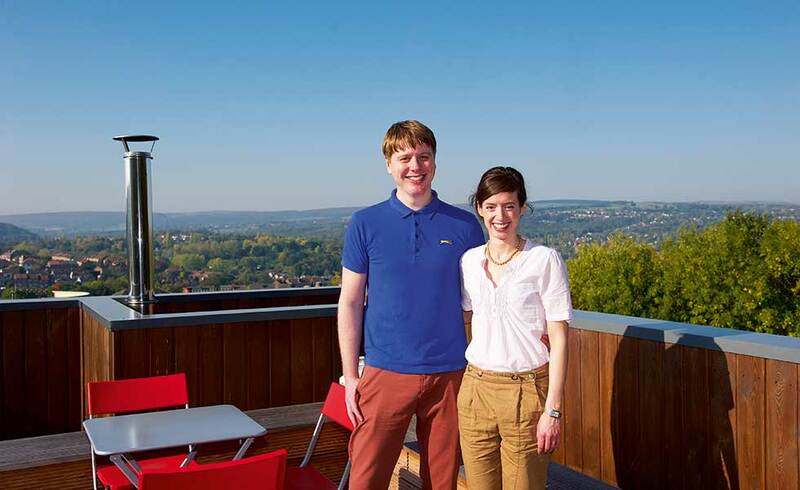 Party Wall agreements were made easy, as the couple already owned the property next door. The only major upheaval was the need for a flue to be relocated to the rear, allowing the new house to abut the gable end. The new home also proved cost-effective to build, coming in at £139,000, as it was built with a Kingspan TEK Building System [structural insulated panels] that offered slim walls, great eco credentials and a fast build time — the shell of the house was erected in just two weeks.